This is first run ammo that met the U.S. Military's strict quality assurance standards and specifications. Packaged in a new Sealed Mil-Spec reusable ammo can, These Federal 5.56mm rounds feature 62 grain, full metal jacket boat-tailed casings with a steel core. Ammunition is loaded on 10-round stripper clips for convenience. Other features include green painted penetrator tip, non-corrosive, and boxer primed with fully reloadable brass cases. Get it with FREE shipping. This ammunition has passed Military Specification Testing and is NOT Quality Control Rejected Ammunition. This ammunition does not carry the label "NOT FOR DUTY USE". What kind of groups are you getting with this ammo ? BEST ANSWER: Ten in a group, three groups of ten all snuggled away inside. Its milspec ammo, look up what the standard is. If you have to ask with m855 then knitting might be the hobby for you. If I purchase two of these items, do I get free shipping for both? BEST ANSWER: Come on Chris, is this a joke question or are you new to buying things online? Yes, you will get free shipping for both. Why is it advertised free shipping but charging me to ship to south Carolina? BEST ANSWER: Says free shipping on this item only. Did you buy more that just that item? Palmetto State is based in South Carolina so you have to pay state tax and in-state shipping. Do you have this ammo in 1000 rd. Count with the lake city first run seal? BEST ANSWER: This ammunition is made sold under the U.S. Army "Armament Retooling Support Program" to utilize idle production lines and packaged for Federal Ammunition. You need to contact Federal about your packaging desires. Why do you say it's sealed from the factory and the picture shows a lead seal when in fact that's not true at all? "If the ammo has LC on the headstamp it is Lake City product. This product can be zip tied or lead seal. Thank You, Federal Ammunition Tech Services"
Factory is using a type of zip tie now. I haven't gotten any with a lead seal in quite awhile. Mine have all come with either a lead seal or sealed in some way. I have never had an issue with this ammo, it is excellent. Mine have only come with zip ties which I know are not factory. They should come with serial numbers and mnfg. date on a lead or tamper proof seal. Ditto. I was disappointed in mine not being factory sealed, but it does cycle and fire great. I have received 14 cans of this over the last 5 years and all were black zip ties. Ditto. All has been great other than not factory sealed. There's one in every crowd. All cans come with a plastic zip tie that 'seals' the can and provides tamper evidence. Mine was a red zip tie. Mine both came with a zip tie only. I didn’t care it was for shooting not storing. All the ammo cans from federal come zip tied. Mine came with a zip tie instead of the seal. I would speculate that it just means that it was inspected somewhere down the line. Could be at the factory, the distributor, or even the mail. Do you really think that Palmetto is selling something that is counterfeit or mislabeled? I've had nothing but positive experiences with the company. I just received the ammo can and it only had a black plastic tie around latch. No Lake City seal of any kind. Hopefully it is good ammo. The wire seal with metal clamp that is stamped "LC" is original. The black zip-tie is NOT the original seal. Why did I receive an open box product??? BEST ANSWER: This doesn't come with bandoliers, what makes you think is was supposed to? And they took my picture off the site of my product showing up with a plastic zip tie on it, product had been opened, no bandolier’s. All the ammo was there. Ammo looks like seconds. Why does it say free shipping but charging me to ship to south Carolina? BEST ANSWER: 139.99 - 118.99 = ? yes - I too have made this purchase and attempting to do the filing for rebate. I think all the instructions sort of make sense - except that the form specifically asks for a 'receipt' What isnt very clear to me is what aspect of what I have received from PSA is going to be a valid receipt. I have 2 emails one saying I made an order with a part number and a price, then I have a second email with shipping info and part with no price, then I can go into my account as you say and do "view order" which presents what is called "order information". In addition to none of these being a receipt - if indeed what we need is only in our 'account and not in the emails - what about the people who ordered without making an account..
Go to your palmetto account. Look at your order. It will have the order number your address and the payment info. That is your receipt. Print that to a PDF. I forgot to mention. You have to click the PRINT button. That will show up looking like a receipt. Not a web page. Palmetto State Armory is a selection from the drop down box. Federal did the same thing to me on a short offer several years ago. Still good ammo. How do I get the rebate for the ammo? What is it that I'm supposed to send in? And where do I send it? "For Duty Use"? NO! It is made for civilian use so that Lake City and the U.S. Taxpayer can defray the cost of contractors sitting around doing nothing at an ammunition plant when they have no military orders to fill. "For Duty Use" has a different paperwork requirement. Yes its ready to Rock &Roll. Same ammo, but will be marked "Not for Duty Use" or something along those lines. It's a paperwork thing. Like putting do not eat on tide pods. It certainly can be, just not hunting rounds. Are the primers sealed with lacquer on these? BEST ANSWER: Primers are lacquered and asphalt sealant for projectile. From above: "This is first run ammo that met the US Military’s strict quality assurance standards and SPECIFICATIONS." No, clean an shinny. 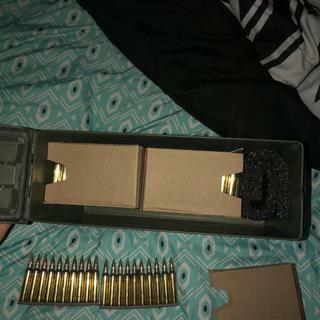 My ammo also came in open ended boxes an had foam packed around edges very nice. Was seal with a zip tie. How do I get my mail in rebate ? No paper work or receipt came with my delivery. BEST ANSWER: To get a copy of your invoice, login to your PSA account. Select "My Account" and then "My Orders". You should see a screen that shows your orders. Click "View order" next to the order where you purchased the Ammo. A screen will open showing the order. In the upper right corner, there is a printer icon with "Print Order" next to it. Click the Icon and print your receipt. All done. Is this new manufactured ammo? Yes it is. New bright and shiny. Accurate also. Is this green tip ammo? BEST ANSWER: Yes, normally the 62 gr, steel core is called "Green Tip". But I have seen the term used kind of loosely. 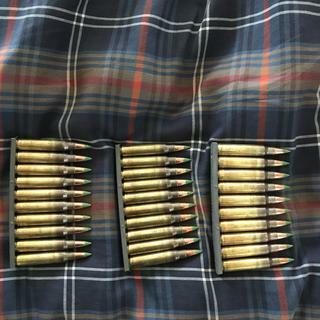 Yes this is green tip ammo. Yes it certainly is, and it will leave a mark on AR500 plates. Yes, the 62 gr steel core ammo in this box is the Green tip. Yes it is. Makes loading mags a breeze! The box I got was green tip. It is green tip. 5.56 NATO. Yes they are green tips. Is this ammo considered armor piercing? So is really forbidden to buy this ammo if iam civilian? Do someone need show some proof that have special license for buy this ammo? Or can anybody buy and get shipped to the address w/ show anything? Yes it is considered light armor piercing, that's what the steel core is for ! Vs lead core m193 which splatters upon impact with armor. It is my understanding that this is a tactical round, not armor piercing. 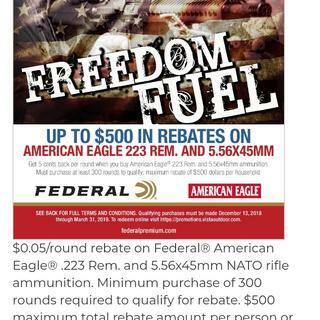 How do I get the rebate after I purchase the ammo? It’s a mission to obtain the rebate. Not PSA fault. Remington makes it almost impossible for you to get the rebate. Have to contact Remington, they will direct you to a web site then you have to follow the 100+ steps to obatain the rebate. You even have to take pictures of the box that your ammo came in. It’s been about a month since I applied for the rebate and still have to seen or heard from Remington. I won’t bother to apply for the rebate again. How does one go about claiming the rebate? Federal webisite and look for rebates. I filled out the complicated rebate forms and sent pictures and still havent gotten reimbursed, what should i do? Should i keep spending money with PSA? BEST ANSWER: PSA has nothing to do with the rebate. If you submitted online at Federals website, it will arrive sooner, but still takes about 8 weeks. What are the extra symbols for? I thought xM855 was steel core? Is this LC1 AC1 meant to hide its true core? Is a "spoon" included to help with magazine loading? BEST ANSWER: There was two in the first can I opened, havent checked any other ones. I didn’t find one in the case I purchased . Yes, mine came with one. Can I shoot this ammo out of my civilian .223 chambered AR? BEST ANSWER: I know its confusing, but the owner's manual usually lists what ammunition you should use. You can also find the clambering written on the barrel of every gun sold in America. NEVER follow the advice of a goober on the internet, unless he is a Nigerian customs agents with a gold shipment stuck in Luxemburg. The short answer is No, you should not. The necks are slightly different and dangerously high pressures are possible when using 5.56 ammo in a civilian .223. You can use .223 in a 5.56 chambered rifle but not vice versa. No, military grade 5.56 ammunition should not be used in a rifle chambered for .223, because of the high pressure of the military rounds, unless specifically recommended by the rifles manufacturer. No! The casing is different and the 556 round will create too much pressure! You need a 556 chambered AR15. It should say it on your barrel. Yes. I shoot both 5.56 and .223 ammo out of my Ruger AR-556 mpr without any problems. "No jams." Are the ammo cans new or used? They appear to be new, or repainted. How many rounds are on a clip ? From what I can remember there’s 10 rounds on each clip. how long is the shelf for this ammo? BEST ANSWER: If the ammo is still in the airtight can and kept cool and dry it will outlast you !! If ammo is stored in a cool dry place manufactures suggest ammo can be stored for 10 years if not subject to high heat and moisture. I have ammo that has been stored properly for 34 years myself and is perfectly fine. this ammo has nearly an enfinatestorage life if stored in a military ammo can in cool dry conditions. Kept dry. Longer than you will be around! How does the mail in rebate work? The ammo came with no info. Download the rebate from Federal Website. Use the receipt you got from Palmetto. It wasn't on a rebate when I purchased it, it was part of a combo deal. get mailed to me with the ammo? No. You have to either print out a form to mail from the Federal website or submit online. I don't believe so, bit I think you're able to apply for the rebate online. You file the rebate on the INTERNET. Are these A.P. rounds ? BEST ANSWER: I filed my rebate electronically on Federal's website. It’s a mail in with proof of purchase, receipt & UPC. Great ammunition shoots good and clean happy so far good. The ammo came in a steel can which I wanted for long term storage. Great product. Would recommend this to anyone!! Great value, get as many as ya can! The ammo is great. The rebate details are too difficult to make it worth my time. Puts the "Can" in American! Let me start by declaring America to be the best country on Earth. Where else can you be sipping bourbon in your leather chair and order 420 rounds of 5.56 online and have it delivered to your door? Holy s—t what a country! 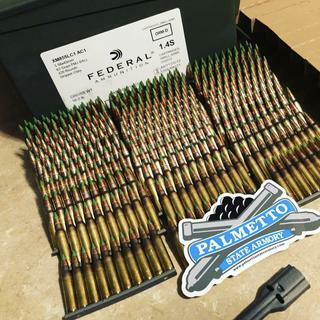 Federal had me when they called their 5.56 62 grain FMJ ammo “Freedom Fuel.” Normally I don’t like anything federal except federal lands because this land is your land, this land is my land (love me some Woody Guthrie), but I’m making an exception here. The only way they could improve this ammo would be if they could manufacture the round to fire bald eagles out, each firing its own little AR-15. 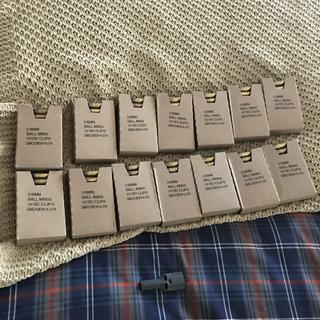 Showing up to the range with the ammo can the rounds come shipped in says “s—t’s about to get real, y’all.” Rounds come in stripper clips (heh, heh, strippers) of 10 rounds, packed in 30 round boxes. Each round is engraved with the words to “The Star-Spangled Banner,” “God Bless America,” The Second Amendment, or freakin’ “Battle Hymn of the Republic.” Grouping is solid, and there have been zero duds. As dependable, as reliable as the wife who hands you another 30 round clip as you empty your last round at looters coming down the cul-de-sac when SHTF. Awesome deal on quality ammo. I snagged 2 cans under a Federal 5 cent off per round rebate. Palmetto State Armory is now on my go-to list for shooting gear. Please keep the good deals coming on this accurate ammunition. 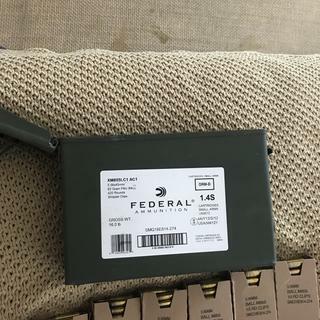 Federal ammo, what’s not to like! Ammo can is a plus. I can find the same package at Walmart, but would cost much more and it would not be delivered to my door even after paying their price. Thanks PSA. Great amo at a great price. This is by far the best deal on 5.56 amo. Great for target shooting and for predators. Will buy again. The rounds are fine but PSA did not provide any info on the rebate. I could not find the rebate. If your going to advertise a mail in rebate providing the form would have been nice!! Great ammo and best value I could find online. I sent in several attempts to get my rebates. Too many hoops to jump through. They obviously don't want to pay. Sorry way to do business. I just received my shipment and the ammo can is plastic with loose rounds. Still not a terrible deal. It’s a good ammo. The good thing is the stripper clips it comes on too! Excellent value,rebate is a joke though. Great deal and fast service! Rebate requires upc codes removed, online receipt and proof of delivery. Proof of delivery does not exist. I would get some if I were you. Good stuff. Great price. Still waiting on that rebate. I bought this product at the end of 2018 and immediately applied for rebate, almost 3 months later nothing. Called 3 or 4 time, although they acknowledge the submission they do everything to dodge the answer why the is no rebate by saying they are going "investigate". This is going on for too long for with too many "representatives". Looks fraudulent to me. Something is very fishy with this. I'll wait another week, if it doesn't clear it's a fraud. Beware I'll come back to this. Best overall Ammo on the market! Great Ammo! Great price! Great service! I have already shot it up so will definitely be ordering more. Everything was exactly as described. Quick and complete delivery in a very sturdy metal ammo can. The brass you can reload. I live in Missouri I can buy as much as I want,this is the good Ammo. Good price. Great, no issues, every round down range. Great deal on some great ammo. Good ammo at a good price. But there is actually no mail in rebate, despite it being advertised as such. Works great, decent accuracy. Holds 1.5 inch groups at 100 yards. I normally buy this ammo at Walmart for $174.00 a can I saw this in PSA and purchased 2 cans. I saved around 40 dollars a can. 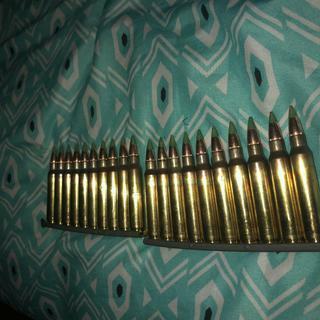 I love this ammo I have even reloaded the brass. You can count on me buying more. I haven’t shot this ammo yet. But I can’t wait to shoot it. I just got into shooting and this was my first ammo purchase. I’m glad I went with PSA ! I recommend this product, I wish it came with another stripper clip guide. My order didn’t come with a sticker, but I don’t mind. Other than that the shipping was fast and free and it came with exactly 420 rounds and a stripper clip guide. Rebate never came, it's been months. Ammo is fine. It is ammo!! Range time!! Great stuff!! Never can get enough ammo!! Came in on a timely manner!! Range time here I come!! Can't Beat This Ammo And At This Price... Wow! I'm not a rich man, so when I saw this quality ammo at this low price, I could NOT pass it up! I stocked up a bit. Bought 1 can of this to try out, very nice ammo shot well, good price, ordered 2 more cans, Get some.